It’s a corner garden at the narrow end of my small, urban slice of the Earth. It’s mostly about foliage in this garden because it’s also shady, with a dribble of sun here and dapple of sun there. 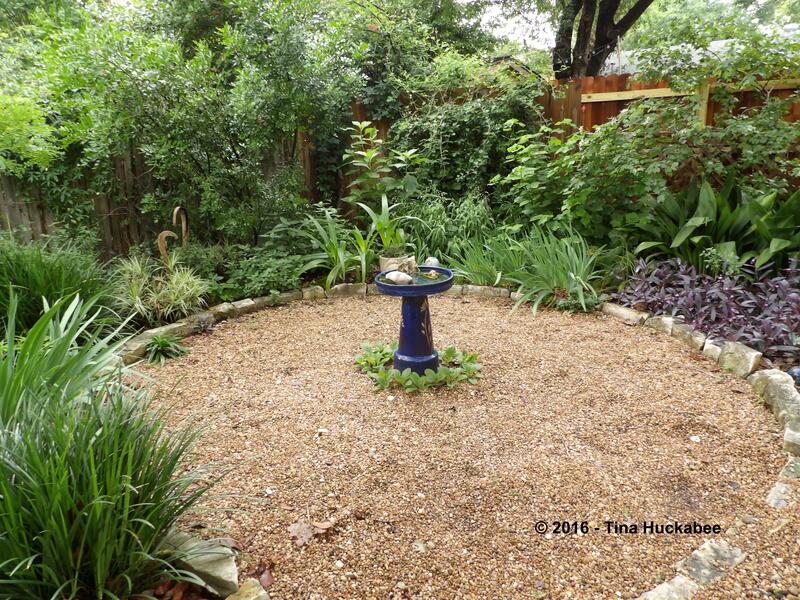 A variety of different plants envelop the negative space that is the pea gravel walk with the blue bird bath at its center. For this post, I’ll focus on certain sections–the center corner and the adjacent left and right sections. At the far end of the garden is a combination of leafy greens. Toward the front, the Four o’clock is deciduous, but blooms a deep, fragrant pink flower at night during the growing season. If I irrigated more, I’d get blooms from the Uruguayan Firecracker, but this is a dry garden–I must content myself with its lovely foliage, which is the main reason I planted it. The white-blooming Tropical sage, Salvia coccinea, (clustered at the back and not currently much in bloom) is meh in the foliage department, but the bees and I adore the white blooms, which appear throughout the growing season. The Texas Mountain Laurel, Sophora secundiflora, sports evergreen foliage year-round, plus adds height and width to this area, contrasting with the smaller perennials. Behind that and draping along the fence is an evergreen, Blue passion-flower vine, Passiflora caerulea, which is a host plant for the Gulf Fritillary butterfly. 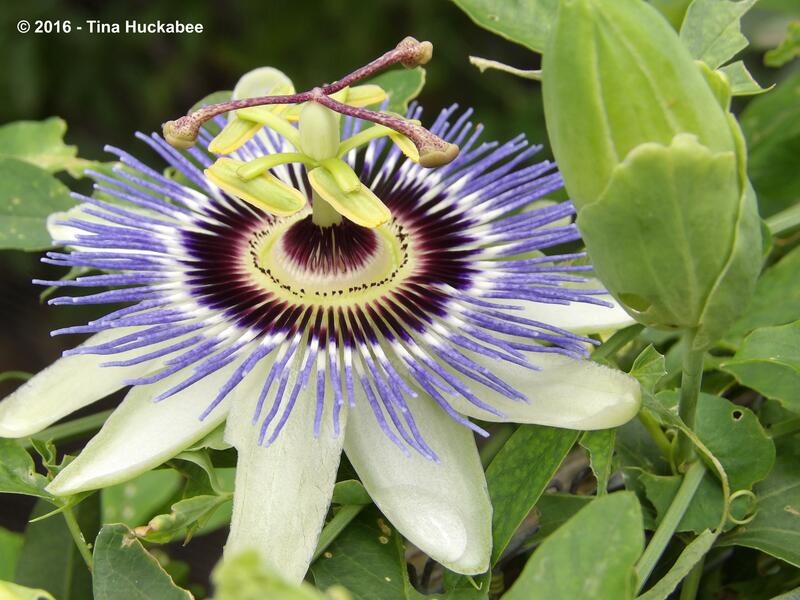 Along with its twining foliage, the Passion vine blooms magnificently and bees and butterflies appreciate that. Sparkler Sedge, Carex phyllocephala ‘Sparkler’, truly sparkles in the garden. I’ve enjoyed this plant (there are two specimens in this bed) though Sparkler breaks one of my gardening rules: don’t plant if it doesn’t feed something. 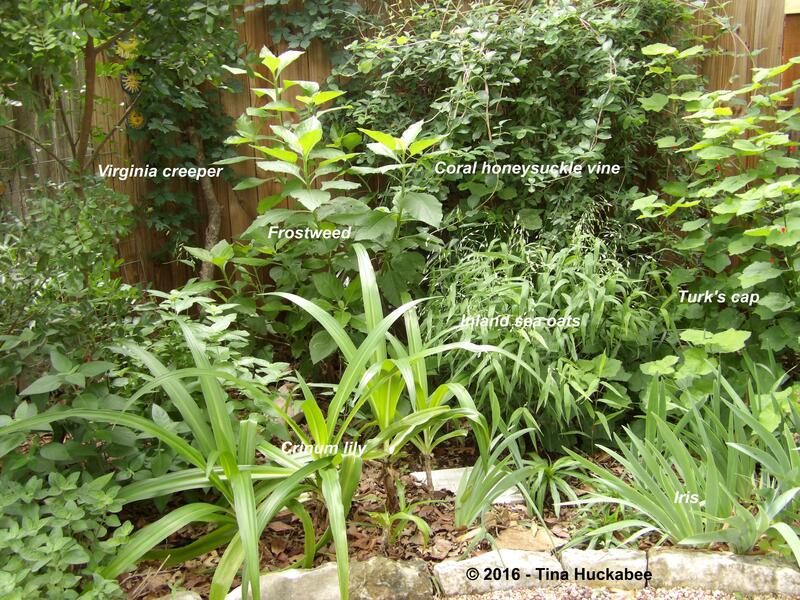 The second Sparkler sedge is located toward the back, underneath the Mountain Laurel, competes for attention behind the Four o’clock and the Uruguayan Firecracker plant, both of which will get a little larger–though not huge– during the course of the growing season. But what’s life without a few broken rules, right? Sparkler sedge is water-wise and beautiful and that satisfies two other qualities that I look for when deciding what to plant and that’s good enough for me! I like the juxtaposition of the various round-to-oblong perennial foliage combined with the jaunty straps of the Crinums. Moving to the center, we find an evergreen Coral honeysuckle vine, Lonicera sempervirens, clamoring up and along a fence. 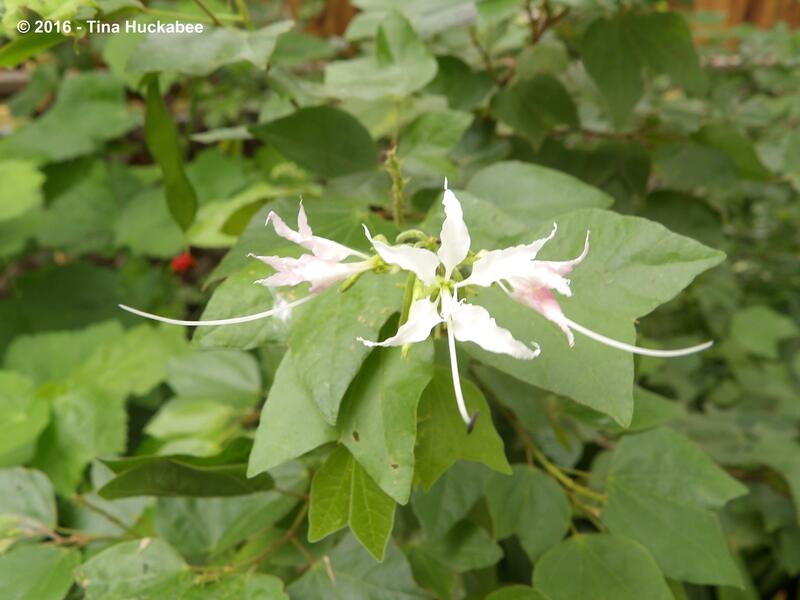 Gorgeous tubular blooms appear primarily in spring, but there are a smattering of blooms throughout the warm season. 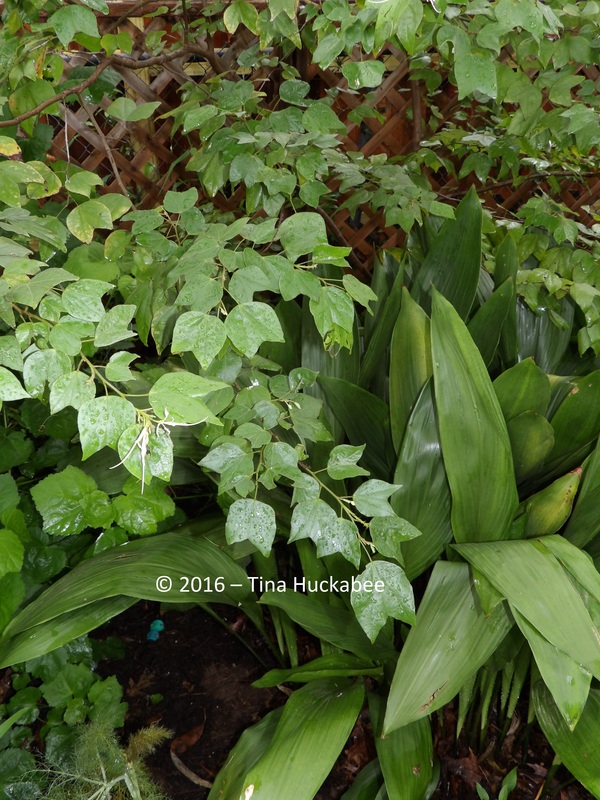 I like the foliage of this vine because of the cool-season burgundy tinge to the leaves and the year-round reddish stems. 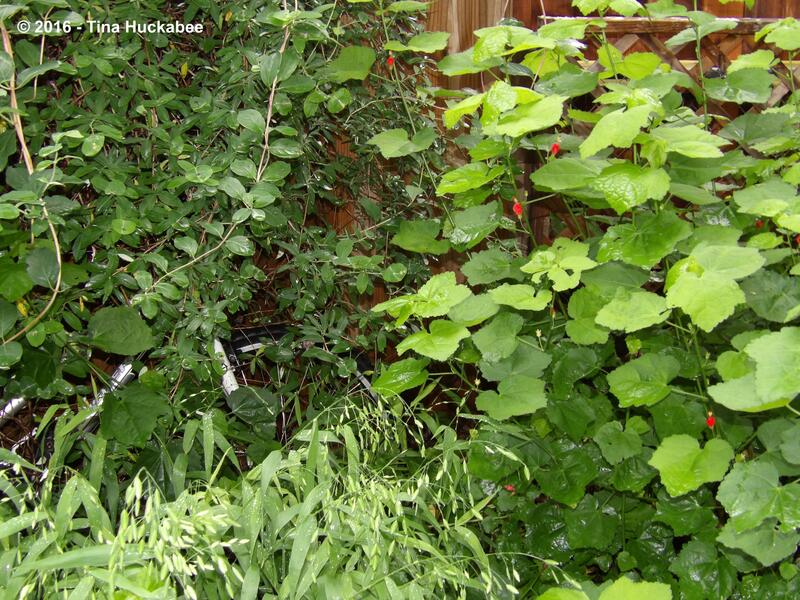 A vine is a good addition in a small area because it allows for vertical growth and suggests a living wall. ….and will gracefully adorn this grass until late next winter. 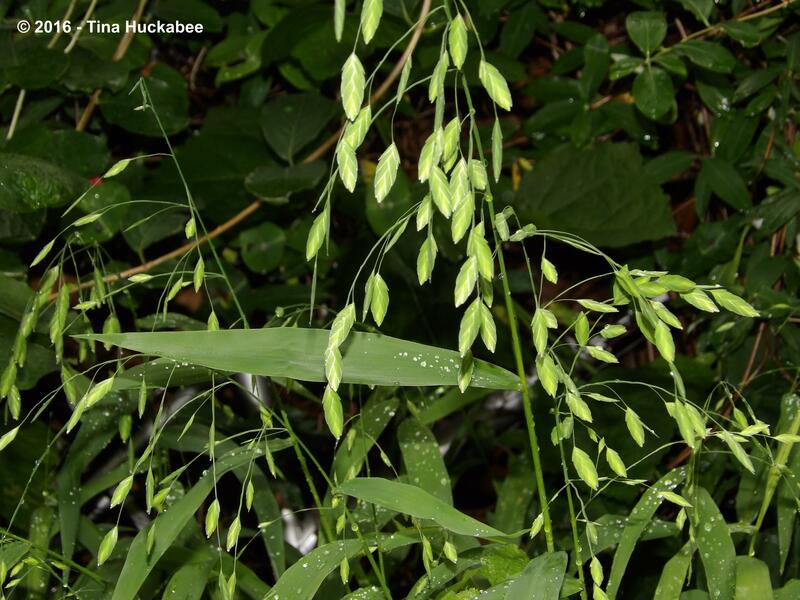 Left of the oats is a tall, big leafed Frostweed, Verbesina virginica, a white-blooming, stately perennial, timed for nectar consumption by Monarchs during their fall migration to Mexico. For most of the year though, the leaves steal the show with their generous girth. My beloved daughter, Shoshana, who died in 2006 at the age of 13, loved riding her bicycle. It’s home for the last couple of years has been entwined in the Coral honeysuckle, but the bicycle is now nearly covered by the vine. I don’t mind the bike’s shy peeks through the foliage, but I may to consider moving it at some point. For now, Shoshana’s bike stays. Behind the Frostweed, a generous bird or mammal planted a Virginia creeper, Parthenocissus quinquefolia, which is a second vine in this corner section. This specimen doesn’t achieve the stunning fall color that it would were it planted in full sun, but it’s a great addition to the foliage gang of this garden, nonetheless. 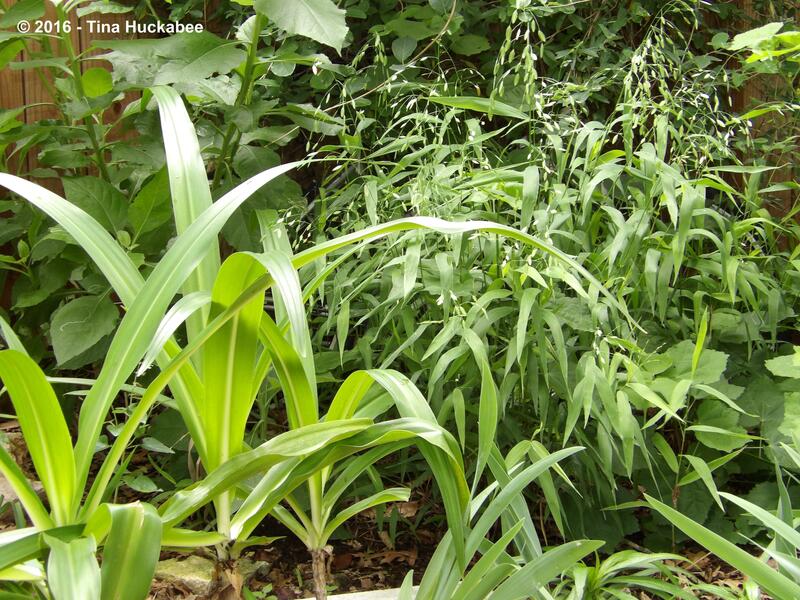 Fronting this lot, at the bottom-left, are a collection of unknown Crinum lilies (from my parents’ garden) and Iris plants at the right. The Crinums rarely bloom; regardless, I love them for the foliage. The Iris are reliable spring bloomers. …and added a potted Dyckia, (I often misplace the name tags of container plants, so I don’t remember its name. My bad. 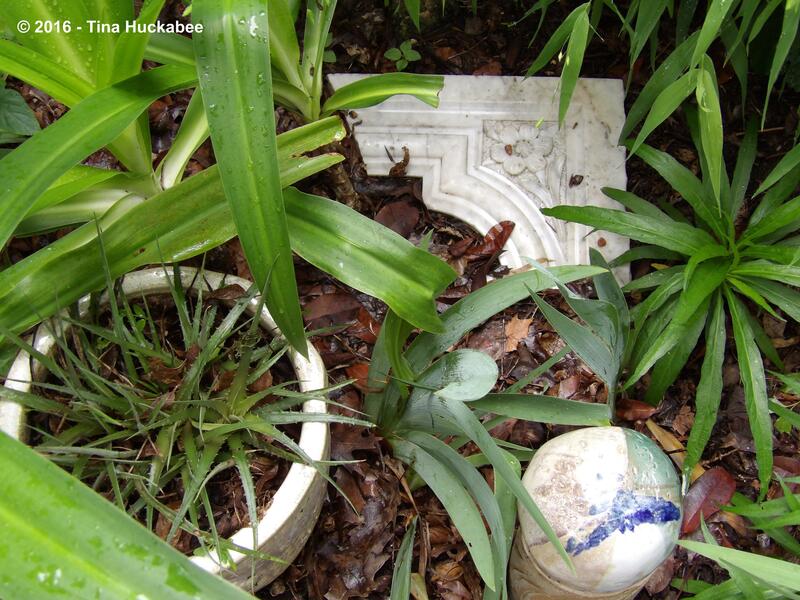 ), a silly Tina-made ceramic garden sculpture, along with a corner piece from an old fireplace, which now doubles as a stepping stone. I want the eye drawn to this spot–the center point of the garden–and I found that the combo of the three yard-art pieces worked well, without being overwhelming. 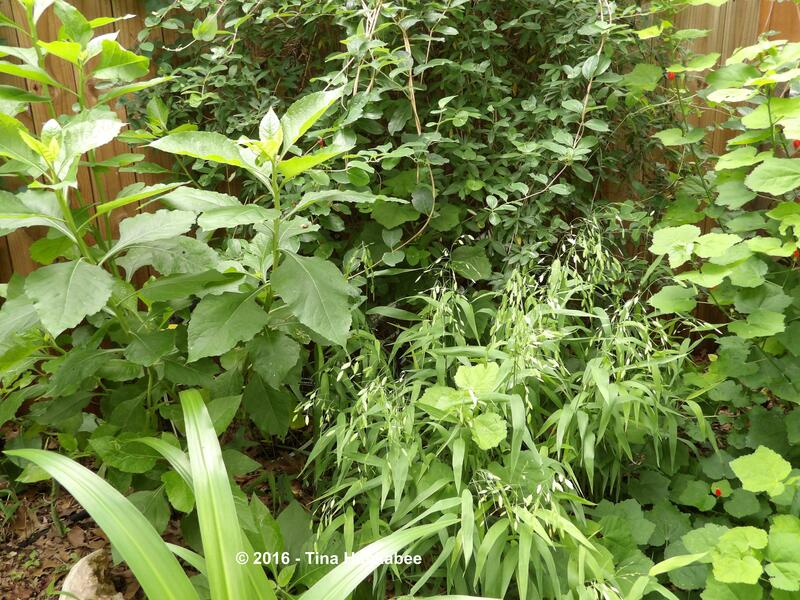 To the right of this corner of mixed foliage, grows a favorite native Texas perennial of mine, Turk’s cap, Malvaviscus arboreus. Iris is an evergreen, spiky punctuation at the base of the herbaceous perennial, Turk’s cap. 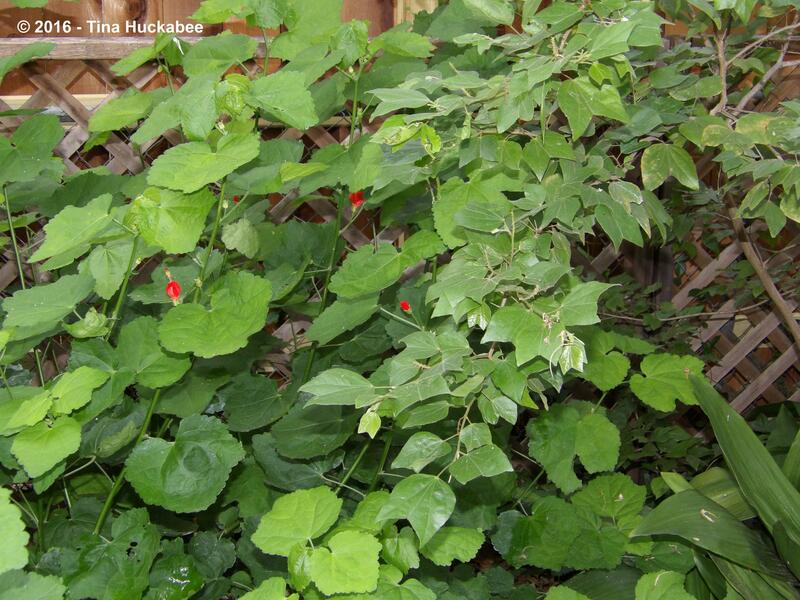 ….it’s the foliage that I prize on Turk’s cap. The wide, tropical leaves evoke lushness, even in the hottest, driest time of the year. 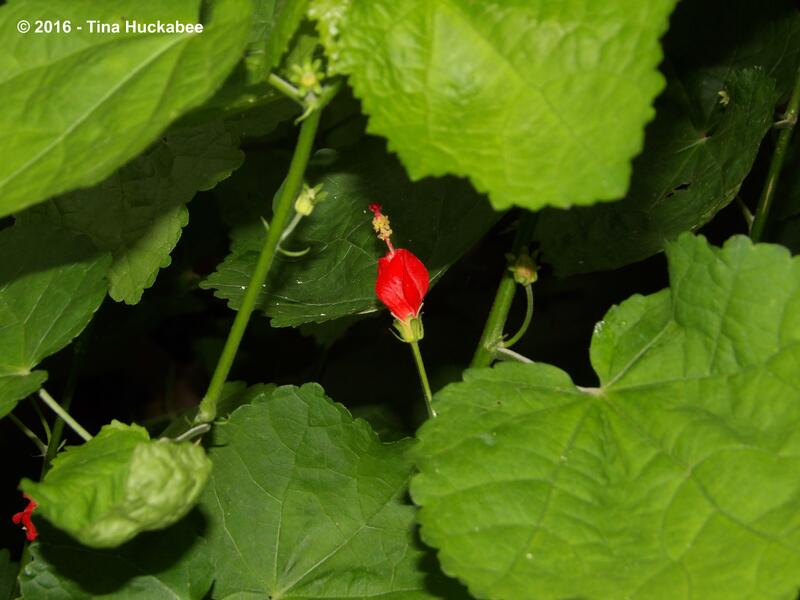 Turk’s cap is a remarkably tough plant, too, as well as a valuable wildlife plant. Rambling further right along the arc of the garden continues another set of favorite foliage plants. Next to the Turk’s cap grows a Mexican Orchid Tree, Bauhinia mexicana. In a normal year (one where we have winter!) this tree would have been knocked to the ground by a freeze. This year, it remained evergreen and honestly, I’m not complaining about that. I’m thrilled that it’s already bloomed fully–twice–this spring, and will bloom on-and-off until late next fall. When the blooms are new, there is a blush of pink to the petals. These stunning blooms are favorites of butterflies. …and fun foliage. The foliage reminds me of deer hooves. Paw-shaped Turk’s cap leaves (left) and ungulate hoof-shaped Mexican Orchid leaves (right). Mexican Orchid tree foliage pairs with the evergreen Cast Iron Plant foliage. 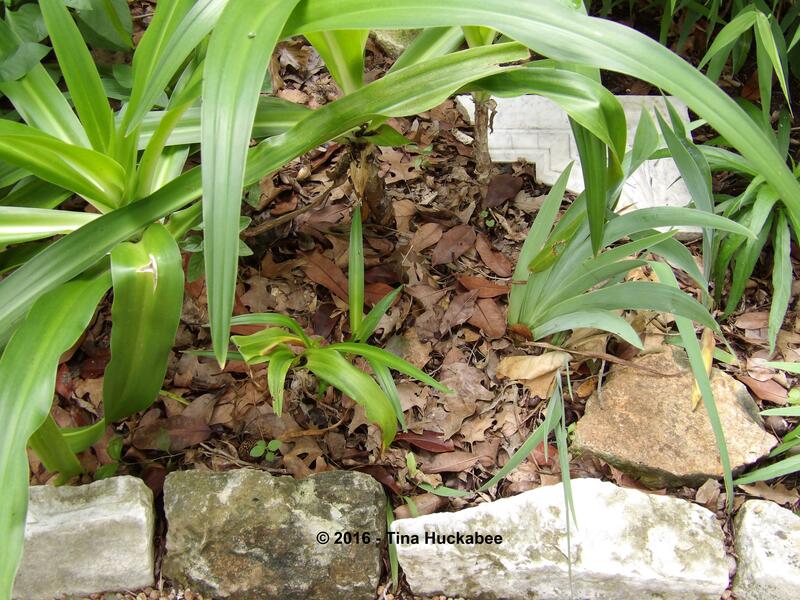 At the base of the Orchid tree, are a group of evergreen Cast Iron Plant, Aspidistra elatior. 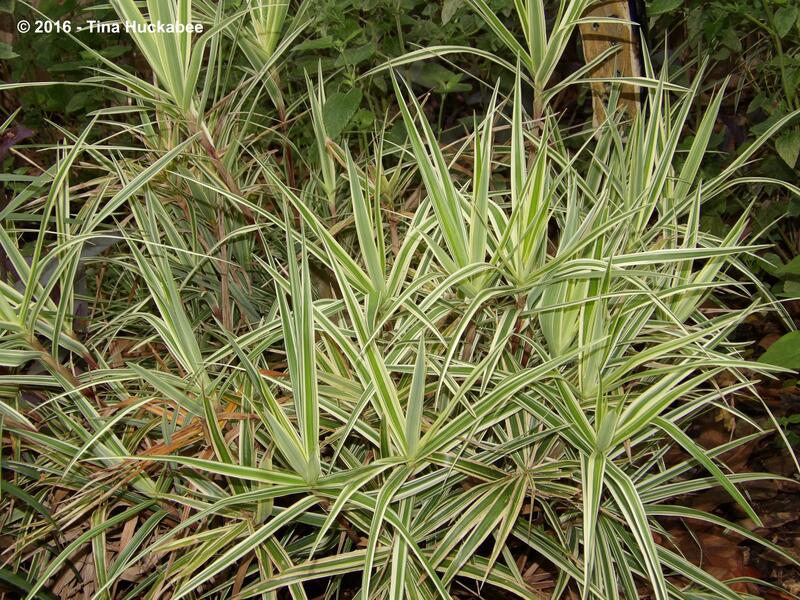 Another plant that doesn’t produce obvious seeds or blooms, it provides cover for a variety of critters (lizards especially) and is as water-wise, xeric a plant as you’ll ever not water. I planted the Cast Iron so that when the Orchid tree disappears during winter dormancy, there’s remains some foliage action in that part of the garden. In front of the Cast Iron, sprawls a native-to-Mexico, naturalized-in-Texas, groundcover, Purple Heart, Setcreasea pallida ‘Purple Heart’. I have fond memories of this plant, having grown up along the Texas Gulf of Mexico coast. 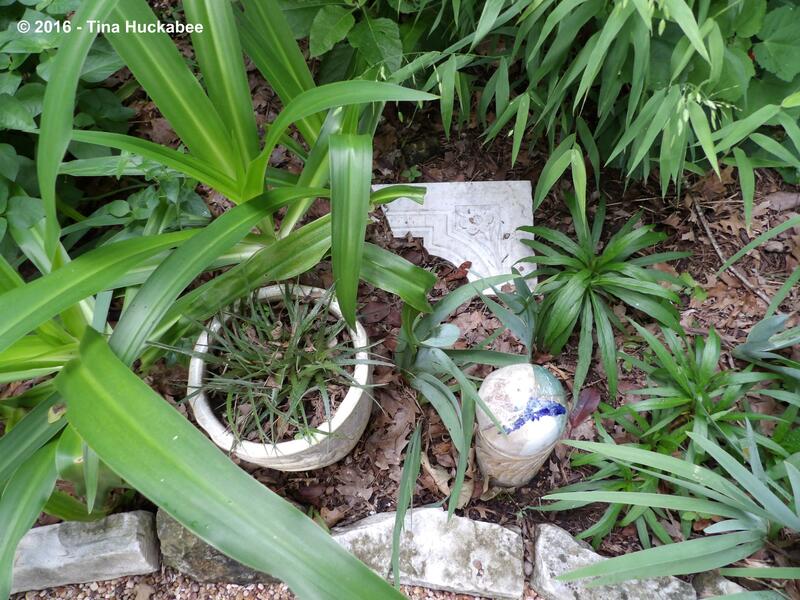 My mother planted Purple Heart along with bananas, ferns and other assorted tropical plants and I remember playing in her garden–probably annoying the gardener with my stomping feet and resulting crushed foliage. Sorry, Mom–I’m a grown-up gardener now and I get it! 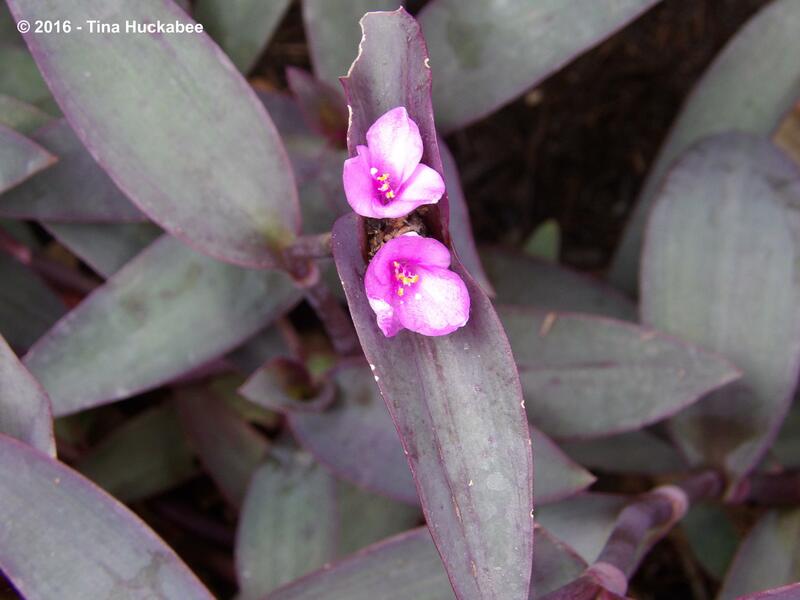 Along with its purple/pink/green foliage, the Purple Heart rocks charming, bee-friendly blooms. A snail (probably) munched the top part of the leaf, just above the top bloom. Grrr. I’ve recently removed some dark blue Mexican stones that loosely encircled the base of this birdbath, in favor of a group of seedling Lyreleaf sage, Salvia lyrata. I liked the stones–a much darker blue than the ceramic bird bath–but every time my dog, Asher, rolled around in the pea gravel (which is often) he jumbled the configuration of the stones. I didn’t want the stones permanently set, instead, preferring them dry-stacked. But the mess Asher made, coupled with an abundance of Lyreleaf seedlings, was all the encouragement I needed to remove the stones and plant the Lyreleaf. I’m enjoying the ruffly effect of the seedlings underneath the birdbath. Later in the year, the foliage will develop a pretty, deep purple-blue veining in the leaves–which you can see the beginnings of in the photo. Additionally, blooms appear in spring and are a beautiful blue-lavender which will complement the birdbath. This is not the entirety of the corner garden and perhaps I’ll profile the remainder during another GBFD. Most of these plants bloom at some point, but the various greens and leaf structures are what interest and please me most about this garden. 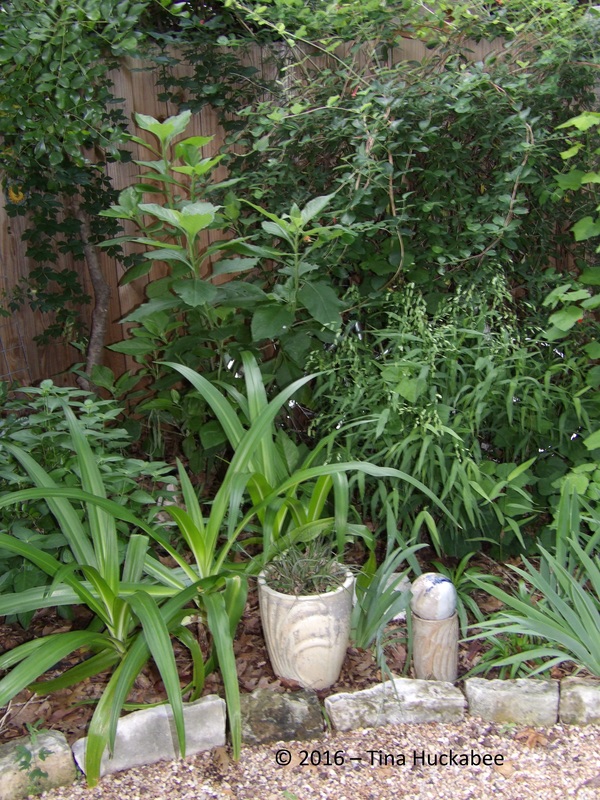 My one regret is that there isn’t a large variety of foliage-colorful, drought-tolerant plants, appropriate for shade and that provide something for wildlife, that I can use. 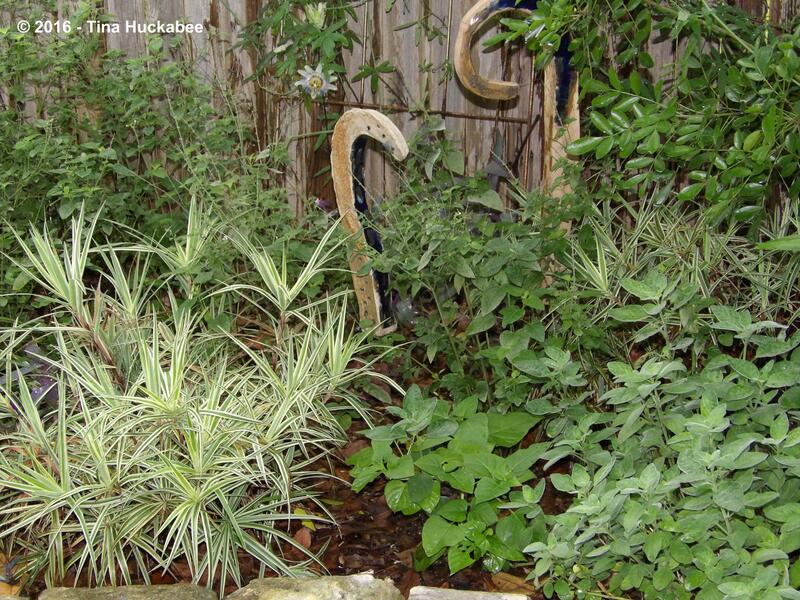 I guess it’s a tall order: a dry-shade garden which can take the Texas-tough climate conditions that also feeds/protects wildlife and that showcases more-than-green foliage. Oh yeah, I’d also prefer to use as many native Texas/North American plants as possible. I’m not the least bit particular about planting, am I? 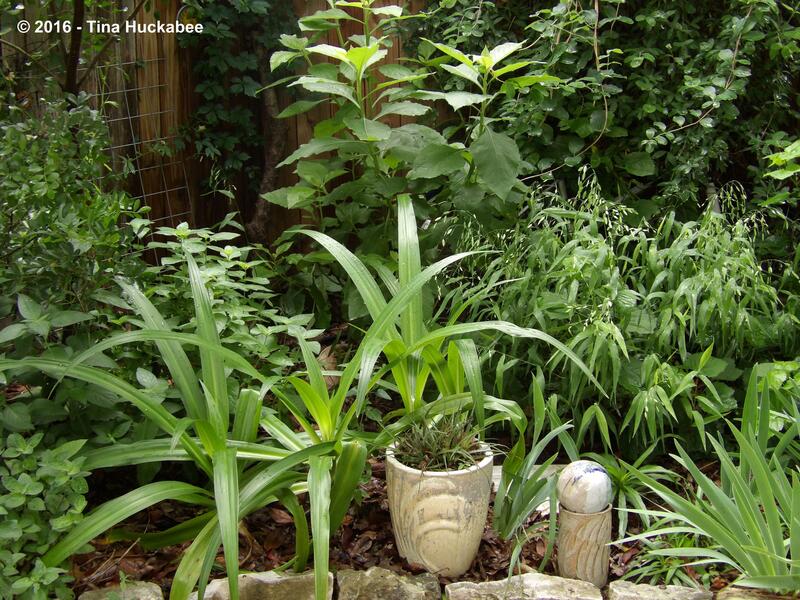 Whether you’re particular or not, join with me in celebrating foliage in the May garden and thanking Christina and her lovely Creating my own garden of the Hesperides for hosting. Share your leafy loveliness and then check out her Garden Bloggers’ Foliage Day for a look at foliage in many gardens, from many places. 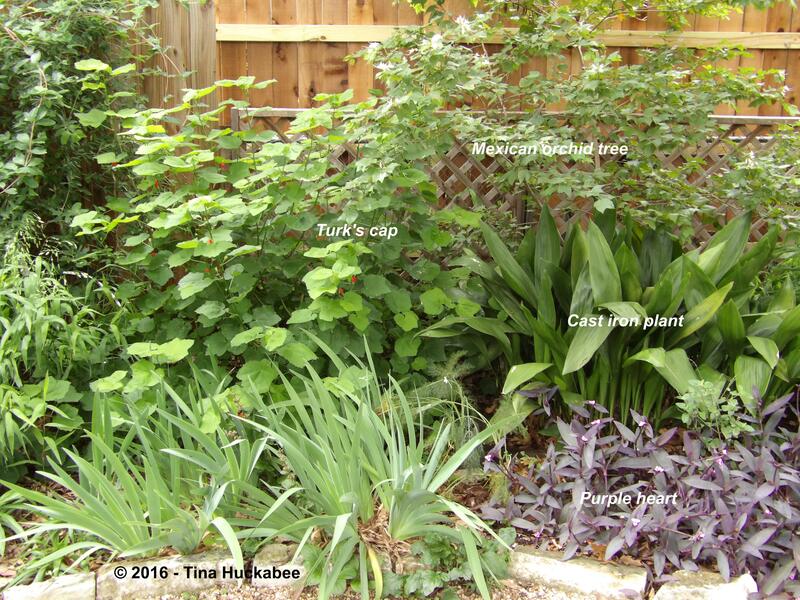 This entry was posted in Dry-shade Gardening, Foliage plants, Uncategorized and tagged Garden Bloggers' Foliage Day, GBFD by Tina. Bookmark the permalink. Brilliant post Tina, I love this section of your garden looks like a great place to have a chair and sit in the shade for a while to enjoy the lush cool feeling. You have so many plants I know nothing at all about so it makes fascinating reading. Thank you, and thank you for linking to GBFD. 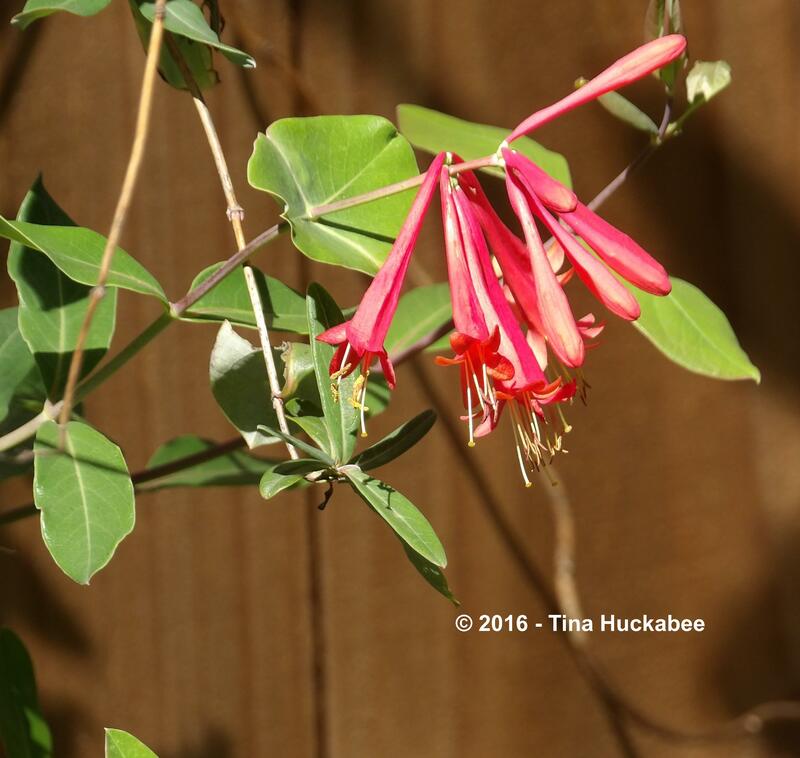 Thanks, Christina–and thanks for hosting.That’s the special thing about gardening/garden blogging–we can share our plants and ideas while also learning from others–so fun! 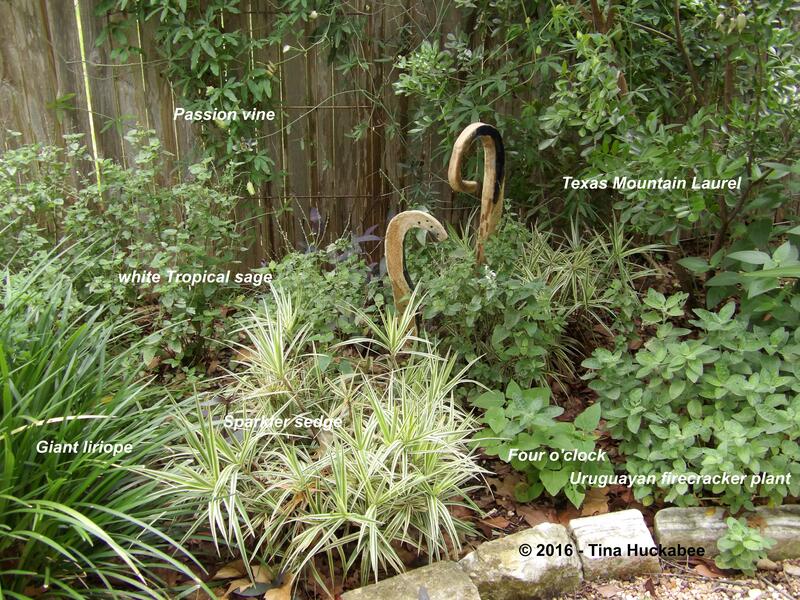 Tina, your corner garden is such a delight, filled with lovely and interesting plants. I am so sorry to learn about the loss of your young daughter. The bicycle peeking out is one more special reason to adore this space. Thank you, Susie. It is a nice garden–I’ve grown to appreciate the shade and emphasis on the foliage, rather than the blooms. Shoshana’s bicycle just seemed to fit well there–and you’re right, it makes a special place, more so. Right?! I’ve enjoyed both of those plants, though I must say that the Sparkler is much better behaved than the Passion vine. As warm and humid as it’s suddenly become, iced tea is a must-have. Tina all your garden plants are magnificent. 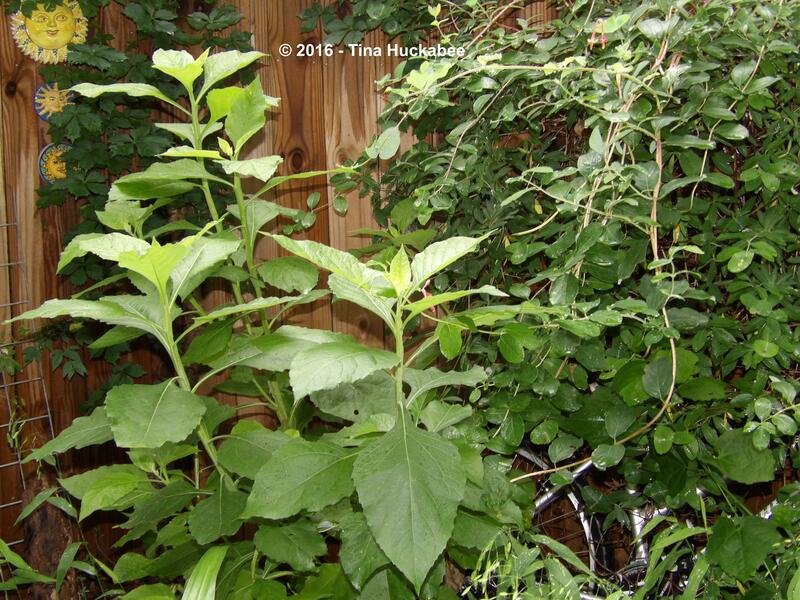 I especially like the Passiflora caerulea, the Malvaviscus arboreus and Bauhinia Mexican. We share the have and love the purple heart and Aspidistra elatior. Thank you very much for teaching and explain its wonderful garden. Greetings from Margarita. Thank you, Margarita! 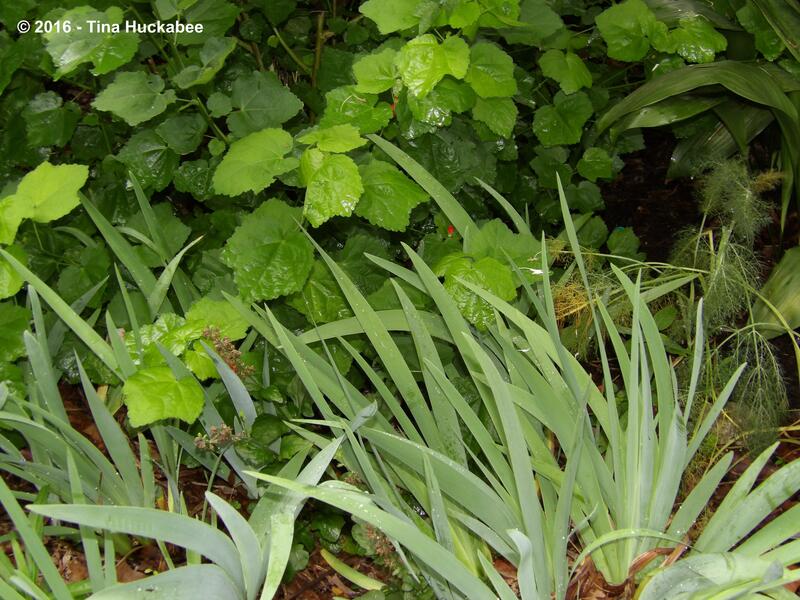 It’s nice to know that we have affection for similar plants–they’re certainly well-worth liking, aren’t they? 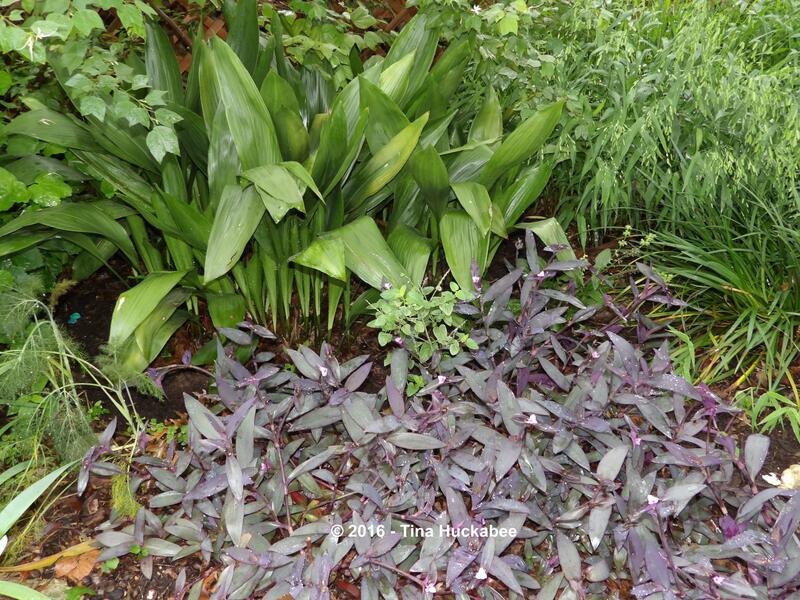 So Tina purple heart is beautiful and the Aspidistra elatior is sensational. It was the first plant brought from the jungle-not what place- that used to living in the homes of the England of Queen Victoria, back in the nineteenth century, and was a great success of. But you know that already. It is a very hardy plant that fits inside and outside not very cold. Greetings from Margarita. I love that your focus is on wildlife and not some silly design trend. I am so sorry about your daughter. I had a cousin who died at the same age. I still think about her. I love that you added her bike to your garden. Well, Tammy, me too. :) I’m also sorry about your cousin–tough to bury a loved one, but especially at such a young age. I love Shoshana’s bicycle as part of the garden. I’m sorry about your loss of a daughter but she is now part of your lovey garden. Yes, Jenny–Shoshana is definitely a part of the garden. 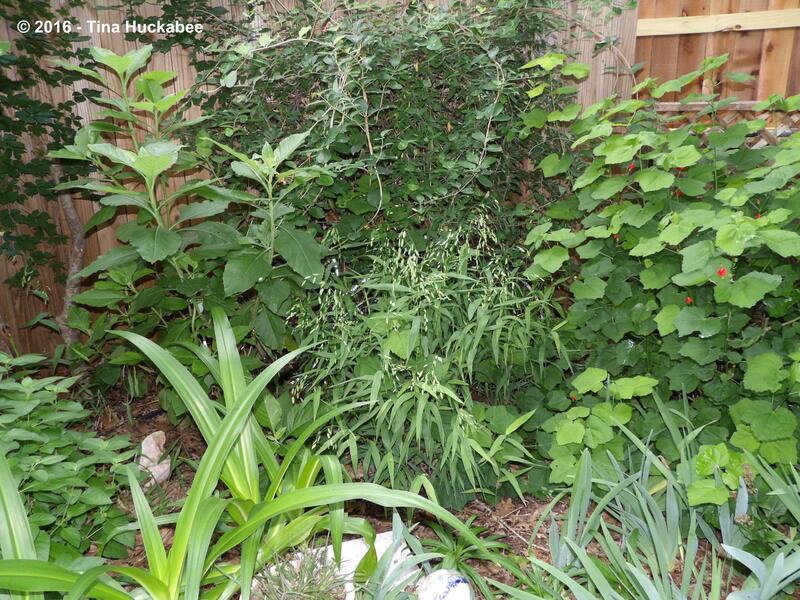 I love your Corner Garden, such a great mix of plants that all flow together – and the Passionflower Vine! You’ve taken a challenging spot and made something very special. Thanks, Jason. I am pleased with this garden. What a beautiful garden! The design is pleasing to the eye and filled with such a large variety of plants. Turk’s Cap is one of my favorites and I can attest to its hardiness. During a re-do of our backyard, we hired people to remove almost everything that was planted, except the trees and the Turk’s Cap. Somehow our instructions weren’t communicated well to the crew and before I could stop it, the Turk’s Cap was gone and a worker was hacking at the root ball with an axe. I tried to stop him, but he didn’t understand English and the foreman was not around to interpret, so I left him to do his thing. He worked on it for over an hour, chopping and hacking, doing a thorough job. He must have missed a little bit though, because a few weeks later it was back and I was thrilled. 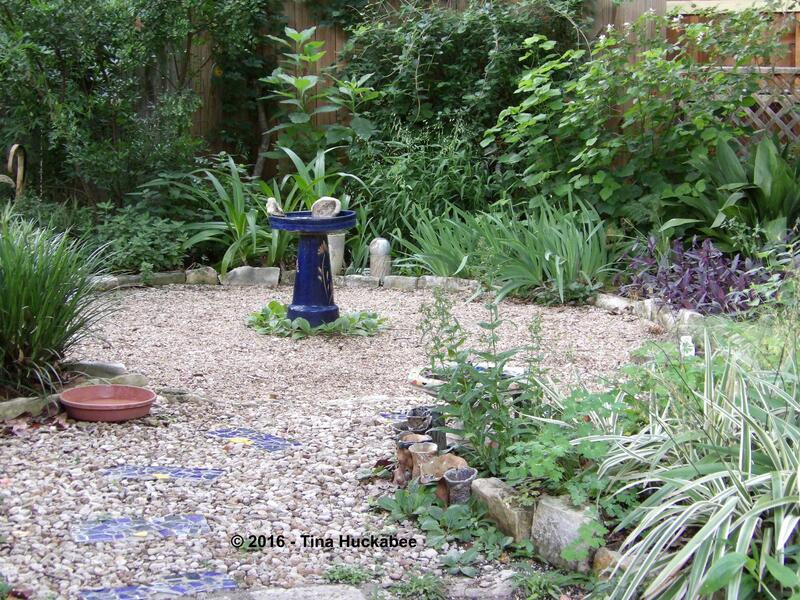 Thanks, Tracy–I’ve enjoyed this garden quite a bit. 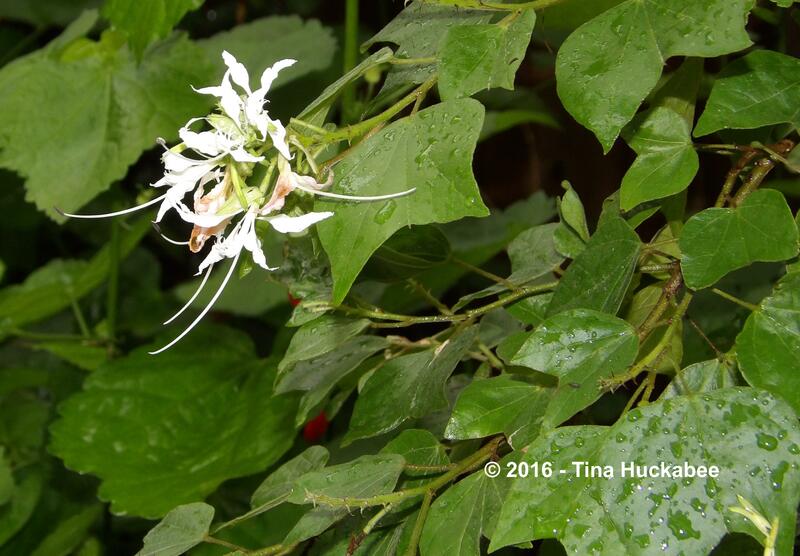 I love your Turk’s cap story–so true and telling! I’ve advise folks to make SURE they want the Turk’s cap THERE, because once it’s planted and established, it ain’t going anywhere! Your corner garden (a little slice of paradise on earth it seems to me) is lovely in so many thoughtful ways. 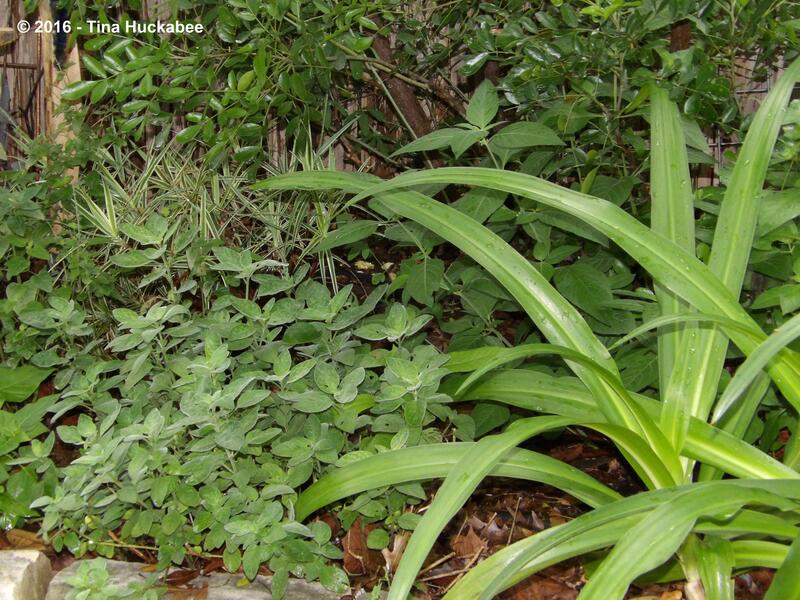 Your plant list reads like a primer for native dry shade performers. I’m glad you pointed out what is planted around the birdbath base. That ruffle caught my eye straightaway – it is very effective. Looking forward to seeing a shot in another season of the sages in bloom! I’ve got an Anacacho Orchid, Bauhinia lunarioides, and it is one of my favorites. It is (mostly) winter hardy and now that it is getting a bit taller and receiving more sun, the white flowers dance on every breeze. When I bought it I had no idea how much I’d come to like it or I’d most certainly have bought two! Thanks, Deb. I don’t know why I didn’t think of the plants around the bird bath before, but I’m tickled with their look. I love Anacacho orchid–a great choice for a native tree! I was given a tiny seedling of the Mexican orchid when I was volunteering at Zilker, before they paid me to work there ( 🙂 ). I The seedling was tiny, tiny and I planted it in the fall. We had freezes that winter (about 7 years ago?? ), but it came back and has every winter since. I just love it and for that spot, it’s perfect. You are an artist. I love the sage circle around the fountain. And your crinums! Inspiring. I have a few that are seemingly indestructible but they need to be moved to a sunnier place. I think I will use your image as a guide. My heart squeezed a little thinking about your daughter’s bike. A hidden treasure in a paradise. Awe, thanks Debra. Actually, what I really am is lazy! 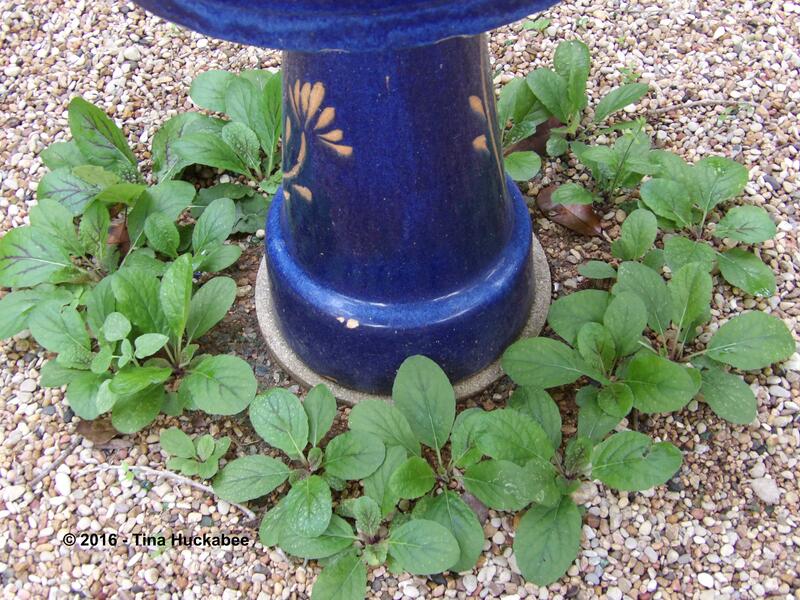 I wanted “something” around the birdbath, but that “something” needs to be low or no maintenance, hence circle of lyre-leaf from the multitudes of seedlings. I love the crinums and they have a special place in my heart because they come from my parents’ gardens, but mine rarely bloom. I was visiting my father this past weekend and his were blooming–so beautiful and fragrant.